As if I did not have enough half finished and unstarted wargames project, I am about to add another one to the list. I really must get organised with more painting time though and start to clear some of these. It has started with this book. A modern telling of the tale of Erik Haraldsson known as Bloodaxe. Erik Bloodaxe lived from the late 7th century until he was finally assassinated in 954 C.E. The book has been (and still is) a ripping read and of course it has fired my interest in adding some Vikings to my wargame collection. As I mentioned in Another Project – Vikings in 6mm, I have a fine collection of Two Dragons Vikings here in 15mm but I want to build the Vikings in 6mm. 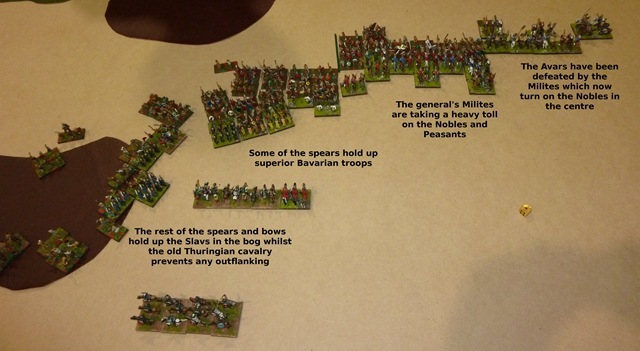 I originally started thinking about just two armies in 6mm and set them for DBA and/or Basic Impetus. That would have required about 400 figures all up using the basing scales I use of 15mm base sizes and 3 or 4 6mm figures for each 15mm figure. Wargamer’s megalomania has now clicked in and I am thinking that 10 armies would make a nice collection. With those I could probably morph a few other traditional enemies if I wanted to. So Baccus 6mm Vikings are nice and while the ones illustrated to the left from the Baccus website are based on a 60mm base, basing on 40mm will look similar, just 4 figures per rank less. Thinking about a Pre-Feudal Scots as well – such is the megalomania! So, I will need more than the original 400 digures considered and this will therefore go from being a nice little project to a big one. The option other than Baccus is to use Heroics and Ros figures who also have their Vikings, Saxons and Normans and could therefore provide most of the figures here. This will lead, of course, to a few days pleasure planning and combing through catalogues. I am also still considering the naval side with some additional bits, such as 6mm Snekke and Drakkar from Heroics and Ros. Another option is the 1/1200 scale Viking and Saxon vessels from Navwar. 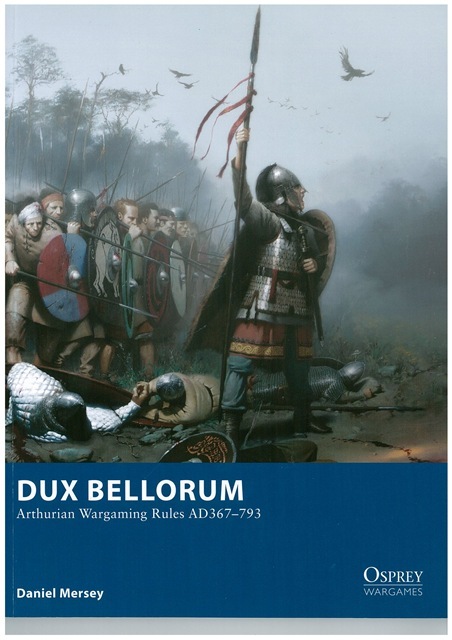 I pre-ordered Dux Bellorum from Amazon.com a few weeks ago. I have been reading the author Daniel Mersey’s blog over recent weeks and frankly, with all the hoo-haa over DBA version 3.0 and Phil Barker’s intractable desire not to move with the times with regards to writing style (1920) and format (1815) I was looking for something new and simple and that would not require a major investment in time or figures. Lest I be unfair, I was also dismayed with the hoo-haa that came along with the DBA 2.2+ extension as well. Good bye DBA, hello something new. The rules cover the period 367-793 CE, Britain’s Dark Ages and even provide for the legendary Arthur. 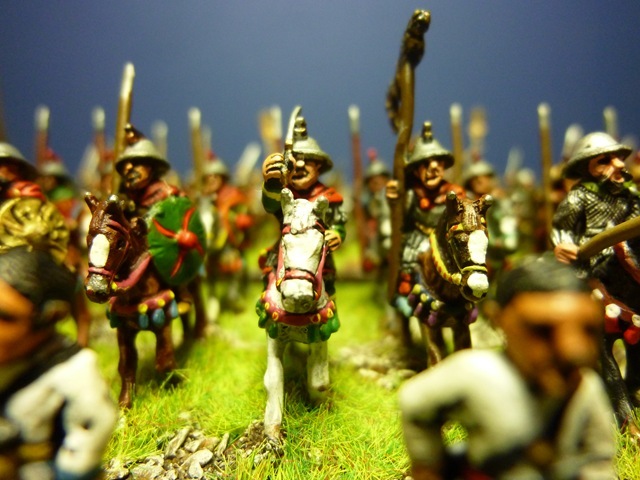 The armies specifically mentioned in the rules include Romano-British, Picts, Saxons and Irish. There is no preferred figure scale for these rules either, or base scale for that matter as they use the concept of Base Widths for movement – so each side should be based on the same frontage bases but that is about the only requirement. The book itself is in typical Osprey 64-page format printed on nice shiny paper (yes, I know that I have become a eBook/PDF magazine tragic lately but sometimes a little paper is nice). OK, enough of the technical stuff, down to the details and content. Like most Ospreys, the book contains illustrations from previously published Osprey works that are relevant to the period the rules cover. 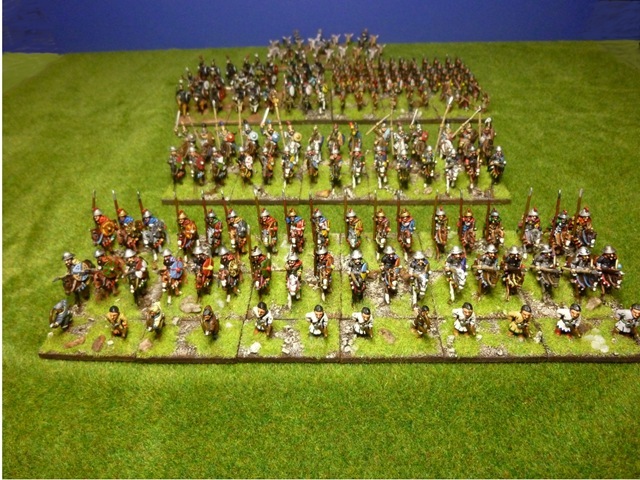 Also included are photographs of various Dark Age warriors in differing wargames’ scale – the eye candy. It’s obvious that the eye candy is there to pad out the book to take it to 64-pages but hey, I ain’t complaining, especially as the price was excellent at Amazon. The rules themself are well laid out. The first chapter deals with the background and I guess design philosophy of the rules. This is followed by a chapter explaining the basics of the rules, the unit types and statistics, basing, measurement and best of all, a couple of sample army lists to get the newbie started. The crux of the rules are covered in the next chapter, “Playing the Game”, which covers setup, deployment, moving, missile fire, brawling and such. There are the joy of all wargamers, army lists, in this chapter along with ending the game, and strategies and tactics. The next chapter of the rules covers some pre-set Scenarios as well as providing some ideas for further scenarios. The rules are rounded off with some quick reference sheets and army roster. The rules throughout have diagrams next to the rules explaining points of movement and combat. They are also liberally laced with tables making the information clear and easy to understand. Overall, it looks like learning the rules without an experienced player around will not be an onerous task. I for one am really looking forward to getting into the meat of these rules over the coming days. I’m sure there are other Wargames stores offering this for sale as well. I purchased my from Amazon along with a copy of Paul Eaglestone’s A World Aflame which I will look at tomorrow or Saturday. From what I have seen and read so far, I think I am going to like these rules. 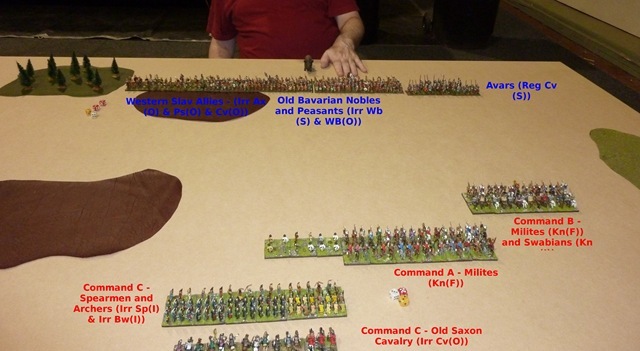 My first competition game at Cancon 2011 (well, at any time really) was against Dave Turner, a Canberra local, and his Book II, List 73 Old Bavarians with Avar and Western Slav Allies. This gave him a good troop mix with the Avars providing Superior Regular Cavalry (Reg Cv(S)), the Western Slavs providing a lot of Auxilia (Irr Ax(O)) which are useful for broken terrain along with some Psiloi (Irr Ps(O)) and cavalry (Irr Cv(O)). The Bavarian part of the force consisted of a large mass of warband, both Noble (Irr Wb(S)) and Peasants (Irr Wb(O)). Using the two allies is risk for Dave as there is a chance that one of the commands will be unreliable at the battle start. However, against that is the resulting army which has a mix of a lot of warband infantry – always a problem for any opponent – backed up by some quality cavalry in the Avars and some good bad terrain troops with the Western Slavs. I was the invader in this battle so got to deploy second which was an advantage. Dave managed to deploy some difficult terrain that allowed him to sweep around on his right flank and restricting my deployment. I had decided that I would deploy my weakest knight command (Command B – see my previous post on Cancon 2011 – the Eastern Franks) to face the Avars. I hoped that they would be able to engage the Avars and keep them busy long enough for my main strike command, Command A, to do sufficient damage to the warbands to cause some consternation for the Bavarians. In the meantime, my infantry command would act to delay the Bavarian right flan. Well, that was the plan. The battle started very early, at 5:00 am in fact. It was a cool autumn day with a strong wind blowing from the southwest. I was facing east. I advanced the knight commands forward as fast as I could to engage and get them involved as I was not confident with the ability of my infantry to stand too long. The weaker command engaged the Avars as planned as the main strike command closed in the warband. In the meantime the Slavs advanced quickly across the bog and started to swing in on my left. The general’s command struck the warband and started to push into them. The Avars, however, had been shattered by now so my right flank Milites and Swabians started to swing in on the main Warband. The left flank command of the Franks was holding up the Slavs well, with the Archers in particular holding their own against the Auxilia in the bog. The spears were holding some warband back. The overall plan worked at the Old Bavarians finally cracked and broke. I had won my first competition DBMM game. By the time the battle had completed I had lost 5 elements of Milites and 9 elements of spears and bows. This was just over 15% of my force so by the scoring rules, I lost 2 points for each 10% of my force lost. These two points were then deducted from the 25 points awarded for each game to give a result of 23:2 in my favour. I must also thank Dave for being a true gentleman throughout the game, even assisting me with advice at one point of time in the game. On to the second round. I had decided to play the De Bellis Magistrorum Militum (DBMM) competition at Cancon 2011. Looking through the army lists as well as the figures I had at home I had settled on something Carolingian in appearance. I had some figures that I had acquired at a bring and buy in the UK and had never used them. This was the chance. A couple of games with Doug as a test of some army compositions (as well as an introduction to the rules) occurred and I finally settled on Eastern Franks circa 933 C.E. This period was shortly after the transition from the Carolingian Empire to the split between Eastern and Western Franks – the Eastern Franks eventually taking the title of the Holy Roman Empire. As a result, I felt using the essentially Carolingian figures worked with this army. The stratagems taken were Scouting and Feigned Flight. The army itself, when laid out, looked like is shown below. The next instalment will cover the first of the games.